Each month we do our best to highlight useful resources. We hope you enjoy what we've dug up! A resource bulletin from Southern SARE featuring farmer experiences plus the latest research in a guide to raising chickens and turkeys using pens, movable fencing and pastures. Each year, USDA agencies make long-term commodity projections used to prepare the President's budget and forecast farm program costs. The projections are released in February following release of the President's budget. Innovations in Local Food Enterprise: Fresh Ideas for a Just and Profitable Food Systemaddresses one of the most complex issues facing food access and regional food system development allies today: how can consumer price and producer cost meet in ways that transition healthy, local food from a privilege to a right? 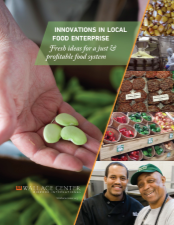 Innovations in Local Food Enterprise analyses and aggregates a collection of innovative solutions to overcoming difficult food access and food equity issues with a focus on market-based consumer-driven solutions for low-income underserved communities. The National Sustainable Agriculture Coalition released a Farmers’ Guide to Value-Added Producer Grant Funding. 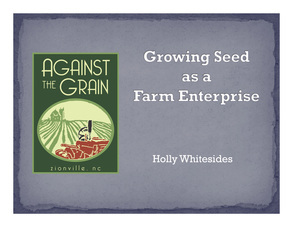 This guide is being released on the heels of the U.S. Department of Agriculture’s announcement of $14 million in available funds for fiscal year 2012 for Value-Added Producer Grants (VAPG). Applications for the competitive grants program are due at USDA State Rural Development offices by October 15, 2012. The Guide, available for free download online, includes clear information on new program rules and contains a step-by-step description of the application and ranking processes, with helpful hints to improve a producer’s chances of obtaining funding from the highly competitive program. It also describes the program priorities for small and medium-sized family farms, beginning farmers and ranchers, socially disadvantaged farmers and ranchers, and mid-tier value chains (regional supply networks with active farmer participation). 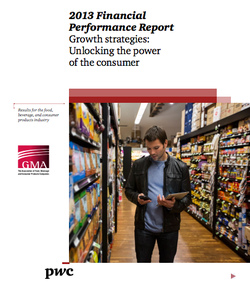 2013 Financial Performance Report from PwC and the Grocery Manufacturers Association (GMA), Growth strategies: Unlocking the power of the consumer. This report addresses the question: how does one capitalize on the ephemeral relationship between consumer and CPG, whether it be via a social networking site visit, a retail partner in an emerging market, or a purchase from a company’s website? September 2013: Thinking about hosting volunteers or work exchanges on your farm? There is a lot to consider when bringing work exchanges or volunteers onto your farm for short or longer term stays. Here is a guide developed by Woodland Harvest Mountain Farm. They use this for orienting new volunteers and workers to their small permaculture homestead in Ashe County ,NC. also to advance a collective sense of priority actions. Identifying priorities in this context can be challenging, primarily because what we are trying to influence is a system, in which the success of the whole depends on proper functioning of interrelated parts." This report attempts to identify the needs and opportunities in North Carolina's food system that will help us progress towards a more sustainable food and farm future. 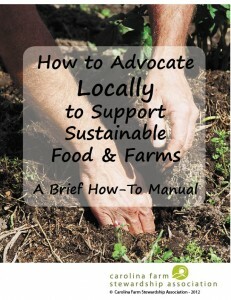 This 2013 guide from the Center for Environmental Farming Systems (CEFS) serves as a resource to help community members create a more local food economy. "First in a series of research studies dedicated to advancing knowledge on the issues and trends most important to our agriculture and food system clients"
"On a deeper level, we want to fundamentally understand how people behave, why they behave that way and what influences their behavior..."
The share of U.S. farms operated by women nearly tripled over the past three decades. Using Census of Agriculture data from 1978 through 2007, this report provides detailed information about women farmers and the types of farms they operate. From the USDA's Agricultural Marketing Service. Winter/Spring 2013 Edition. Includes information about the SPecialty Crops Inspection Division, USDA Market News, and more. Click the picture to learn more. For the past three years, Carolina Farm Stewardship Association (CFSA) has been researching and testing a model of organizing at the local level. 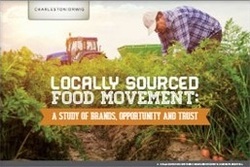 After a series of meetings with local food activists, farmers and organizers, CFSA has distilled key lessons for doing local food organizing in the Carolinas. This web-based tutorial includes these key lessons, actions steps, inspirational success stories and resources. This research project was funded by the Southern Region Sustainable Agriculture Research and Education program (SSARE), and sought to identify determinants of sustainable agriculture practices adoption by engaging in three activities: a comprehensive literature review, a survey of change agents, and interviews with farmers who had adopted sustainable practices. 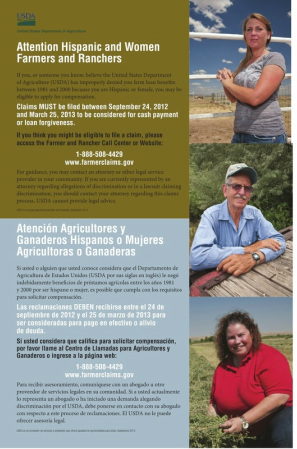 Did you face discrimination by the U.S. Department of Agriculture (USDA) based on being female, or based on being Hispanic, in making or servicing farm loans during certain periods between 1981 and 2000?